For other uses of "Mohamed Salah", see Mohamed Salah (disambiguation). Mohamed Salah Hamed Mahrous Ghaly (Egyptian Arabic: محمد صلاح غالي‎ , Egyptian Arabic pronunciation: [mæˈħam.mæd sˤɑˈlɑːħ ˈɣæːli]; born 15 June 1992) is an Egyptian professional footballer who plays as a forward for Premier League club Liverpool and the Egypt national team. Considered one of the best players in the world, he is known for his finishing, dribbling, and speed. Salah started his senior career with Cairo club El Mokawloon in the Egyptian Premier League in 2010, departing shortly thereafter to join Basel for an undisclosed fee. In Switzerland, he starred as he won the league title in his debut season, winning the SAFP Golden Player Award in the process. Salah's performances then attracted Premier League side Chelsea, and he joined the club for a £11 million fee in 2014. However, he was used sparingly in his debut season and was allowed to leave on loan to Serie A clubs Fiorentina and Roma, with the latter eventually signing him permanently for €15 million. Following consistent match-winning performances in Rome to lead them to second-placed finish and a record points-tally in 2017, Salah returned to the Premier League in order to sign for Liverpool for a then club-record fee of £36.9 million. During his second spell in England, he adapted his game from a natural winger to a complete forward and quickly became the focal point of the team. Salah would go on to break the Premier League scoring record for a 38 game season, receiving the Premier League Golden Boot after registering a record 32 goals in 36 league games. His record-breaking performances saw him receive a number of other accolades, including the PFA Players' Player of the Year, the Football Writers' Player of the Year and the PFA Fans' Player of the Year awards. Salah also came third in the award for the 2018 Best FIFA Men's Player. 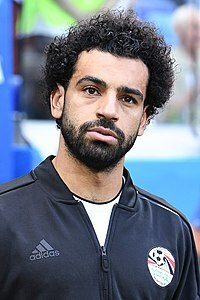 At international level, Salah represented Egypt at youth level, winning a bronze medal in the Africa U-20 Cup of Nations, and participated in the 2011 FIFA U-20 World Cup, prior to debuting for the senior side later that year. Following his performances at the 2012 Summer Olympics. he was named CAF Most Promising African Talent of the Year. Since then, he has helped Egypt reach the final of the 2017 Africa Cup of Nations, and was top scorer during CAF qualification to help the team qualify for the 2018 FIFA World Cup. For his performances, Salah was named CAF African Footballer of the Year, BBC African Footballer of the Year, and was selected in the CAF Team of the Year and Africa Cup of Nations Team of the Tournament. Salah played his youth football with El Mokawloon. He made his senior team debut in the Egyptian Premier League coming on as a substitute on 3 May 2010 in a 1–1 away draw against El Mansoura. During the 2010–11 season Salah continued earning minutes on the pitch, eventually becoming a regular in the team. He scored his first goal for them on 25 December 2010 in a 1–1 away draw against Al Ahly. He remained a regular for Al Mokawloon, appearing in every game of the 2011–12 season. Following the Port Said Stadium riot on 1 February 2012, the Egyptian Premier League was suspended, and on 10 March 2012, the Egyptian Football Association announced their decision to cancel the remainder of the season. Swiss Super League club Basel had been monitoring Salah for some time, so following the Egyptian Premier League suspension, the club organised a friendly match with the Egypt U-23 team. The match took place on 16 March at the Stadion Rankhof in Basel, and despite only playing the second half, Salah scored twice, helping the Egyptians to a 4–3 win. Basel subsequently invited Salah to remain in the city for a week's training. On 10 April 2012, it was announced that Salah had signed for Basel on a four-year contract starting from 15 June 2012. Salah scored on his unofficial debut on 23 June 2012 against Steaua București during a friendly match, a 4–2 defeat. He made his official Basel debut in a UEFA Champions League preliminary stage match against the Norwegian club Molde on 8 August, coming on as a substitute in the 74th minute. He made his league debut on 12 August against Thun, playing the full match. He scored his first league goal a week later, the second goal in the 2–0 home win against Lausanne. Salah scored his first Europa League goal in the quarter-finals on 11 April 2013, as Basel advanced to the semi-finals by beating Tottenham Hotspur 4–1 on penalties after a 4–4 aggregate draw. In the semi-final on 2 May, Salah scored against Chelsea at Stamford Bridge, although they were beaten 2–5 on aggregate. Despite late disappointment in Europe, Basel comfortably won the Swiss Super League season 2012–13 Championship title and finished runners-up in the Swiss Cup. To the start of the 2013–14 Swiss Super League season Salah was member of the Basel team that won the 2013 Uhrencup. Salah scored on his first league appearance against Aarau on 13 July 2013. He scored his first Champions League goal a month later against Maccabi Tel Aviv on 6 August 2013 in the third qualifying round. Before the first leg on 30 July 2013, Salah did not take part in the UEFA-mandated pre-match handshakes with Maccabi players. Basel called the incident a "coincidence" and said it was not intended as a snub. Salah was on pressure from several Egyptian voices demanding from him not to travel to Israel and then criticizing his visit. On the return leg in Tel Aviv, he took part in the handshake line, but offered fist bumps rather than an open hand to Maccabi players. He scored twice against the Bulgarian league champions PFC Ludogorets Razgrad on 21 August 2013 in the play-off round. On 18 September 2013, Salah scored the equalizer against Chelsea in the 2–1 away win during the group stage. During the return tie on 26 November at the St. Jakob-Park, Salah scored the winning goal as Basel beat Chelsea for the second time with a 1–0 home win. On 23 January 2014, Chelsea announced that a deal had been agreed with Basel to bring Salah to London for a fee reported to be in the region of £11 million. Three days later the transfer was completed, making him the first Egyptian to sign for the Stamford Bridge club. 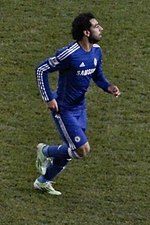 On 8 February, Salah made his debut for Chelsea in the Premier League, coming on as a substitute in the 3–0 win over Newcastle United. On 22 March, Salah scored his first goal for Chelsea against Arsenal at Stamford Bridge in the London Derby, coming on as a substitute for Oscar, in a match which ended with a 6–0 win for the Blues. On 5 April, Salah opened the scoring and later won a penalty and an assist in Chelsea's 3–0 win over Stoke City. Before the 2014–15 season, Salah's future with Chelsea looked to be in a balance after reports suggested he could be forced to return to Egypt to carry out military service after his registration for an education scheme was rescinded by the Egyptian Minister of Higher Education. He was spared of military service after the meeting with the then Egyptian prime minister Ibrahim Mahlab, the Minister of Higher Education and the Egyptian national manager Shawky Gharib. Salah changed squad numbers from 15 to 17 for the start of the season, with his new number having been vacated by Eden Hazard changing to number 10. Salah was rarely used during the season. On 28 October 2014, in a 2–1 win at League Two club Shrewsbury Town in the fourth round of the League Cup, he took a shot that went so far off target that it went for a throw-in. After the game, he and fellow winger André Schürrle were criticized publicly by manager José Mourinho. Although Salah only made three league appearances before his loan move to Fiorentina, Mourinho stated that he would receive a replica winner's medal from the club for his contributions that season. On transfer deadline, 2 February 2015, Chelsea confirmed that Salah would play for the Italian club Fiorentina on an 18-month loan until the end of the 2015–16 season, as part of a transfer deal which saw Juan Cuadrado moving in the opposite direction, Salah chose the number 74 shirt in honor of the victims of the Port Said Stadium riot. Six days after signing, he made his Fiorentina debut coming off the bench in the 65th minute as a replacement for Joaquín in a 3–2 Serie A victory against Atalanta at the Stadio Artemio Franchi. Salah made his first start for Fiorentina on 14 February against Sassuolo, scoring his first goal for the club in the 30th minute. He then provided an assist to Khouma Babacar just two minutes after scoring; the match ended in a 3–1 win for Fiorentina. Twelve days after that, Salah scored his first European goal for Fiorentina, as his side advanced to the Round of 16 of the Europa League, beating Tottenham 3–1 on aggregate. Salah scored the winning goal for Fiorentina against Inter Milan on 1 March, his third goal in Serie A. Four days after that, Salah scored both of Fiorentina's goals in their 2–1 win away to Juventus in the Coppa Italia semi-final first leg. At the end of the season, Fiorentina reportedly activated an option to make the loan move permanent, but Salah refused the move. Even though the loan agreement was for 18 months, Salah refused to return to Fiorentina and instead joined fellow Serie A club Roma. On 6 August 2015, Salah joined Roma on a season-long loan for €5 million; with the option to make the deal permanent, for a reported €15 million. He wore the number 11 shirt. He made his debut on 22 August, as the new season began with a 1–1 draw at Hellas Verona. On 11 September, ACF Fiorentina filed a complaint to FIFA with the claim that Chelsea alleging breach of contract when they allowed Salah to join Roma on loan. On 20 September, Salah scored his first goal of the season against Sassuolo to help Roma salvage a point as the match ended in a 2–2 draw. He went on to score in his following two matches, a 2–1 loss against Sampdoria and a 5–1 win against Carpi. On 25 October, Salah returned to the Stadio Artemio Franchi, scoring the opener against his former Serie A side Fiorentina to help earn a fourth straight league win for Roma. In his return, Salah was also sent off after picking up a second yellow in the closing minutes of the game, only seconds after picking up his first yellow. On 4 November, he scored the opening goal of a 3–2 UEFA Champions League win over Bayer Leverkusen. On 2 February 2016, Salah scored in a 2–0 away win over Sassuolo. Ten days later, on 12 February, he scored in a 3–1 win over Carpi. On 21 February, he scored two goals in quick succession, in a 5–0 home win over Palermo. On 4 March, Salah scored twice in a 4–1 win over former club Fiorentina, overtaking them in the top three. A week later, on 11 March, he scored in a 1–1 draw with Bologna. On 2 May, he scored in a 3–2 away win over Genoa. On 14 May, he scored in a 3–1 away win over Milan on the last day of the league season, scoring the opening goal. At the end of the season, Salah was named Player of the Season, finishing as the club's top goalscorer with 15 goals in all competitions (14 in Serie A) and six assists. On 3 August 2016, Roma made the deal permanent. On 20 August 2016, Salah scored his first goal of the season in a 4–0 win over Udinese. On 11 September, he scored in a 3–2 win over Sampdoria. Ten days later, on 21 September, he scored in a 4–0 win over Crotone. On 29 September, he scored in a 4–0 win over Astra Giurgiu in the group stages of the UEFA Europa League. On 15 October, he scored in a 3–1 win over Napoli. On 6 November, Salah scored a hat-trick in a 3–0 win over Bologna, his first club career hat-trick. On 9 March, he scored Roma's opening goal in an eventual 2–4 defeat to Lyon in the first leg of the round of sixteen in the UEFA Europa League. On 19 March, he scored in a 3–1 win over Sassuolo. On 9 April, he scored in a 3–0 win over Bologna. On 24 April, he scored twice in a 4–1 away league win over Pescara. On 20 May, he scored in a 5–3 away win over Chievo. On 28 May, in the final game of the season, Salah was substituted for legendary captain Francesco Totti, who was playing his final game with the club, in a 3–2 win over Genoa. Salah playing for Liverpool in 2017. His performances in the 2017–18 season saw him receive numerous accolades, including PFA Players' Player of the Year and the Football Writers' Player of the Year. On 22 June 2017, Salah agreed a transfer to Liverpool. He signed a long-term contract with the Reds for an initial €42m fee that could rise to €50m. The fee was a club record, eclipsing the £35m spent on Andy Carroll in 2011. He was assigned the number 11 shirt previously worn by Roberto Firmino who instead switched to number 9. He joined the club on 1 July upon the opening of the summer transfer window, becoming Liverpool's first Egyptian player. He scored on his debut against Watford in a 3–3 draw on 12 August. On 24 August, Salah scored his second goal for Liverpool, in a 2017–18 UEFA Champions League play-off round 4–2 win (6–3 agg) against Hoffenheim, his first goal at Anfield. Three days later, Salah scored and assisted a goal in a 4–0 victory over Arsenal. For his performances in August, Salah was awarded Player of the Month by Liverpool supporters. 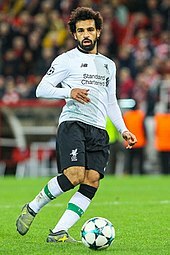 On 17 October, Salah netted twice in a 7–0 Champions League win over Maribor, helping Liverpool to the joint-largest ever away win in the competition, and the largest away win by an English club. On 26 November, Salah scored the opener and refused to celebrate in a 1–1 home draw with his former team Chelsea out of respect for the club as well as victims of the North Sinai Mosque attack two days earlier. Salah hit the top of the Premier League goal scoring charts by scoring twice after coming on as a substitute away at Stoke City on 29 November in a 3–0 win. The following month, Salah netted in a 4–0 win over AFC Bournemouth; a result which saw Liverpool become the first team in Premier League history to win four consecutive away league matches by a margin of at least three goals. In the process, he also became the joint-second fastest player to reach 20 goals for Liverpool on his 26th appearance, only behind George Allan who reached the milestone in 19 appearances in 1895. On 17 March 2018, Salah scored four goals in a 5–0 win over Watford, which was his first hat-trick for Liverpool. In this game, he also broke a record of scoring 36 times in his debut season for Liverpool, and also became the leading goalscorer in Europe's top five leagues – overtaking Barcelona's Lionel Messi and Tottenham striker Harry Kane. Following Salah's record-breaking goal exploits former Liverpool captain Steven Gerrard stated "we are witnessing the start of greatness". On 22 April 2018, Salah was awarded the PFA Players' Player of the Year award, having earlier been named in the PFA Team of the Year for the Premier League. Two days later, he scored a brace in a 5–2 Champions League semi-final first leg win over former club, Roma. In doing so, he simultaneously became the first player from Africa and the first Liverpool player to score 10 goals in a single campaign in the tournament. His double also took him to 43 goals for the season across all competitions, surpassing Roger Hunt's tally of 42, and making him Liverpool's second-highest goalscorer in a single season, behind Ian Rush. He had previously also broken the club's record for the Premier League era, surpassing Robbie Fowler's total of 36 goals set in the 1995–96 campaign, and Fernando Torres' record of 33 for the most goals by a Liverpool player in a debut season. After his two goals and assists in the first leg against Roma, Salah featured in the second leg as Liverpool beat Roma 6–7 on aggregate to qualify for the final for the first time in eleven years. He would then become the Premier League's all-time goalscorer for a 38 game season, registering his 32nd league goal in a 4–0 win against Brighton & Hove Albion en route to being awarded the Premier League Golden Boot. In the 2018 UEFA Champions League Final against Real Madrid, Salah injured his left shoulder in the 30th minute. After initially carrying on, he left the field in tears after going to ground in a challenge with Madrid defender Sergio Ramos; the match ended in a 3–1 defeat. The Egyptian FA stated that this would have no effect on his playing at the 2018 World Cup in Russia and that Salah would still be named in the team's final squad on 4 June. The day after the match, Ramos wrote a message and sent him good wishes. Salah during a warm-up ahead of a pre-season match on 7 August 2018. On 2 July 2018, Salah signed a new long-term contract with Liverpool. Manager Jürgen Klopp said the news was important as a statement of intent in terms of Liverpool's status in the football world in having Salah commit himself further to the club. On 12 August, Salah scored his first goal of the season and Liverpool's first overall goal of the season, in a 4–0 win over West Ham United. On 20 August, in a 2–0 away win over Crystal Palace, Salah played a part in both of Liverpool's goals; winning a penalty for the first after being kicked in the shins twice, and providing an assist for Sadio Mané for the second. On 25 August, Salah scored the only goal in Liverpool's 1–0 win over Brighton. On 30 August 2018, Salah was named on the three-man shortlist for the UEFA Men's Player of the Year, coming in third place, and was also included on the three-man shortlist for the UEFA Forward of the Season, coming in second place. On 3 September he was named on the three-man shortlist for the Best FIFA Men's Player, finishing third. Amid controversy and online protest, Salah received the 2018 FIFA Puskás Award for goal of the year, the winning strike his goal at Anfield in his first Merseyside derby. On 24 October, Salah scored twice against Red Star Belgrade in the UEFA Champions League group stage, with his second goal his 50th for the club. With 50 goals in 65 games he is the fastest player in Liverpool history to reach the half century. On 8 December, Salah scored a hat-trick in a 4–0 away win over Bournemouth, to move Liverpool to the top of the league table. On 11 December, he scored the winning goal in a 1–0 win over Napoli in their final Champions League group fixture, the result qualifying Liverpool to the round of sixteen. On 19 January 2019, he scored his 50th Premier League goal with a brace in a 4–3 win over Crystal Palace, reaching the tally in 72 appearances. In doing so, he became the joint-fourth fastest player to achieve the milestone, alongside Fernando Torres, and behind only Andy Cole, Alan Shearer and Ruud van Nistelrooy. In February 2019, West Ham said they were investigating a video which allegedly showed fans racially abusing Salah, including for being Muslim. On 5 April, he scored his 50th Premier League goal for Liverpool in a 3–1 win over Southampton and in the process broke Torres' record to become the fastest player to reach the milestone for the club, doing so in his 69th appearance. It also saw him become the third fastest to player to reach the milestone for a single club in the Premier League era, behind Shearer for Blackburn Rovers, in 66 appearances, and van Nistelrooy for Manchester United, in 68 appearances. Later that month, he scored the second goal in a 2–0 win over Chelsea which helped Liverpool earn a club-record-equaling 26th win for the Premier League campaign; and the club's second-highest ever wins return in the top-flight after the record of 30 set in 1979. Salah made 11 appearances for the Egypt U-20 team and 11 for the Egypt U-23 team, representing Egypt in both 2011 FIFA U-20 World Cup and the 2012 Summer Olympics, scoring a penalty against Argentina in the round of sixteen of the former tournament, with Egypt losing the match 1–2. Salah was selected for the youth squad to play at the 2012 Summer Olympics scoring in all three of the team's group games. In their opening match on 26 July, he scored Egypt's second goal in a 2–3 defeat to Brazil he scored the equalizer in their 1–1 draw against New Zealand played on 29 July, before scoring Egypt's opening goal in a 3–1 win over Belarus in their final group stage game played on 1 August, securing advancement into the knockout stage of the tournament, where Egypt were eliminated following a 0–3 quarter-final defeat to Japan on 4 August. On 3 September 2011, Salah made his debut for the Egypt national football team in the 2–1 away defeat by Sierra Leone. He scored his first goal for Egypt's first team in the 3–0 win against Niger a month later, on 8 October, in qualifying for the 2012 Africa Cup of Nations. On 10 June 2012, he scored a goal in the 93rd minute in stoppage time against Guinea to give Egypt an important 3–2 away victory in a 2014 World Cup qualifier. On 9 June 2013, Salah scored a hat-trick in a 4–2 away win against Zimbabwe as Egypt won their fourth consecutive match in the World Cup qualifiers. A week later in the following match, he scored the only goal away to Mozambique, putting Egypt into the final qualifying group. On 10 September, Salah scored his sixth tournament goal in a 4–2 win over Guinea, securing Egypt a 100% record to finish their qualifying group and becoming the joint-top scorer among all African teams in the qualification stages. On 10 October 2014, Salah scored in a 2–0 win over Botswana, also scoring in the return fixture on five days later on 15 October, in qualifying for the 2015 Africa Cup of Nations. On 19 November, Salah scored the opening goal in a 1–2 away defeat to Tunisia, as Egypt missed out on qualifying for the Africa Cup of Nations finals for a third consecutive time, with their latest successful qualification being in 2010, when they won the competition for a third straight time. Salah was a member of the Pharaohs' squad for the 2017 Africa Cup of Nations held in Gabon. On 25 January, he scored in Egypt's 1–0 win over Ghana to secure first place in Group D. He went all the way to the final with Egypt, scoring twice and assisting two times in 6 games, earning him a place in the CAF Team of the Tournament. Salah was the top scorer for Egypt with five goals during the 2018 FIFA World Cup qualification, including both goals in the decisive 2–1 victory over Congo, one of which was a penalty in the last minute to make the Pharaohs reach their first World Cup finals since 1990. Despite doubts over his fitness following his shoulder injury, Salah was included in Egypt's 29-man provisional squad for the 2018 FIFA World Cup and was included in their final 23-man squad on 4 June. He missed Egypt's opening match against Uruguay on 15 June, which the Pharaohs lost 1–0, conceding in the 89th minute. On 19 June, Salah scored a penalty in Egypt's 3–1 defeat to hosts Russia at the Krestovsky Stadium, Saint Petersburg. In Egypt's final group game on 25 June, Salah scored his second goal of the World Cup with a chip over the goalkeeper in Egypt's 2–1 defeat to Saudi Arabia at Volgograd Arena. On 8 September, in a 6–0 win over Niger in qualifying for the 2019 Africa Cup of Nations, Salah scored two goals, provided two assists and also missed two penalties. His first penalty, in the first minute of the game, was saved, while the second he converted the loose ball after it was initially saved. A quick, mobile, hard-working and tactical player, with good technique and an eye for goal, Salah is predominantly known for his speed, movement, clinical finishing, agility, dribbling skills, first touch, and ball control, as well as his ability to use both his pace and flair on the ball in order to beat opponents, and create scoring opportunities for himself or his teammates. A versatile forward, he primarily plays as a winger on the right flank, a position which allows him to cut into the centre onto his stronger left foot, and either shoot on goal or play quick exchanges with other players and make runs in behind the defence towards goal; he can also play in the centre behind the main striker as either an attacking midfielder or second striker. On his increased threat in front of goal since joining Liverpool, Salah credits Liverpool manager Jürgen Klopp’s request for him to occupy more advanced central positions, often operating as a main striker, with the forward telling ESPN, "I play closer to the goal than any club before." Salah initially started his career at the left-back position, however, following a 4–0 win over the youth team of Egyptian club ENPPI, Salah was in tears for not scoring after missing several clear chances; this made his coach realize his passion for scoring goals, forcing him to move him to a forward position. While playing Al Mokawloon, American soccer coach Bob Bradley saw Salah play and noted his prodigious speed, explosiveness, and intelligence on the pitch, already evident at his young age. Upon signing for Chelsea, José Mourinho said of Salah: "He's young, he's fast, he's creative, he's enthusiastic. When we analysed him he looks the kind of humble personality on the pitch, ready to work for the team." Mourinho added that Salah has "similar qualities" with "talented players" that he had worked with, such as Gareth Bale and Arjen Robben. His technical skills, pace, left foot, goalscoring, position and direct playing style led him to be nicknamed the "Egyptian Messi", in the Italian media. Brazilian World Cup winner Ronaldo – whom Salah idolized while growing up – stated, "Salah is an incredible player with a tremendous quality. He looks like Messi." Salah has also received praise for having never celebrated scoring a goal against any of his former clubs. Mohamed Salah and his wife, Maggi, married in 2013. Their daughter, Makka, born in 2014, is named in honour of the Islamic holy city of Mecca. Salah is Muslim and often celebrates goals by performing the sujud. Salah during a press conference at the 2017 CAF Awards. Salah features in EA Sports' FIFA video game series: on FIFA 18 he had a rating of 87 and a potential of 90 following his displays for Liverpool. In a 2018 poll by FIFPLAY, a website run and made for the game's fans, Salah ranked first (ahead of Lionel Messi) on who should be the global cover star for FIFA 19, obtaining 77 percent of the total number of votes. Salah has a sponsorship deal with sportswear and equipment supplier Adidas: he wears Adidas X18 football boots. He appeared in an Adidas 2018 World Cup commercial along with other players in the Adidas stable, including David Beckham, Lionel Messi and Paul Pogba, and singer Pharrell Williams. In March 2018, Salah appeared in advertisement for Vodafone Egypt, being filmed visiting several Merseyside landmarks, with the video originally being released in Arabic but was also translated to English. Salah is active in regeneration projects in Nagrig, his hometown where 65% of people live in poverty, donating money to help build a school and hospital. The project includes the construction of an Al-Azhar institute and an ambulance unit. In an interview with Al-Masry Al-Youm, father of the Egyptian footballer Salah Ghaly, claimed that his son refused to accept any financial assistance with the project. During his time in Egypt, Salah's family was once robbed, however, the thief was caught and arrested by police, with Salah's father preparing to press charges against him, but Mohamed convinced him to drop the case. Afterwards, Salah helped the thief financially, giving him some money and trying to find him a job. In February 2018, following a match against Tottenham, Salah donated a replica shirt to young supporter Mohamed Abdel Karim, who was previously pictured wearing a jumper reading Salah's name and shirt number. Moreover, Mohamed Salah has helped more than 450 families by giving them monthly allowances and he also helped the government by giving approximately $300,000 when the country was in a bad situation. At the 2018 FIFA World Cup, at which the Egypt national team were based in Chechnya, the autonomous republic presided by Ramzan Kadyrov, Salah posed for a photo with the Chechen leader after the latter made a visit to the team's hotel and requested a photo shoot with him at the stadium during their team training. Kadyrov later gave him honorary citizenship of the Chechen Republic in a public dinner made for the whole Egypt national team and officials. Several western news outlets and NGOs criticised Salah and the EFA for their interactions with Kadyrov, citing the president's alleged human rights abuses and that the player is used for 'political propaganda' by the dictator during Egypt's national team training camp in Chechnya. In August 2018, Liverpool referred Salah to Merseyside police after footage was posted online which showed him allegedly using a phone while driving in traffic. Salah's indiscretion was brought to light after autograph hunter Rob Wylie posted a video online apparently showing the Egyptian ignoring requests for autographs. Wylie, whose conduct had previously resulted in Liverpool instituting a policy which banned players giving autographs from their vehicles, received widespread criticism from the club's supporters and had to temporarily shut down his website. Salah's relationship with the Egyptian Football Association (EFA) was reported to have soured during the World Cup, after his image was used without his permission to promote the national team's sponsor, WE, the mobile service of Telecom Egypt. At the time of the incident, Salah was sponsored by WE's telecommunications rivals, Vodafone. Liverpool fans created a chant to the tune of Dodgy's "Good Enough", saying that if Salah continued to score goals, they would convert to Islam – "If he's good enough for you, he's good enough for me, if he scores another few, then I'll be Muslim too." Salah gave his approval to the chant, and it has been cited as an example of inclusivity. Salah is devout to a degree that many other well-known Muslims sports figures are not, and his charm and apolitical persona have made him a popular figure in the UK. During his goal celebration, Salah lays in the prostrate position to thank god in sujud. It appears in FIFA 19. Salah is nicknamed "The Pharaoh" by the press and his fans. Salah was given the nickname "Egyptian King" by Liverpool supporters, arising from a chant set to the tune of "Sit Down" by English band James. Following his goal that led Egypt to the World Cup finals for the first time since 1990, a school in Egypt was named after him. Following Egypt's exit from the World Cup, Salah stayed in his home country for his pre-season holiday. In late June, his address was accidentally leaked on Facebook. After this, crowds of fans showed up at Salah's house, with Salah greeting the fans and signing autographs for some, although according to reports in Spain, police did arrive to cordon off his house. During Liverpool's pre-season tour in the U.S. an American artist named Brandan Odums created a mural in the Times Square area displaying Salah in the Egypt kit, with the player later posting an image on social media posing next to it. In Egypt, several murals have also been created displaying Salah's likeness, including one in the capital of Cairo. As of match played 16 November 2018. Egypt score listed first, score column indicates score after each Salah goal. ^ "Egypt" (PDF). AllAfrica.com. p. 5. Retrieved 20 December 2018. ^ "Mohamed Salah". Barry Hugman's Footballers. Retrieved 1 May 2018. ^ Hossam Rabie (6 June 2018). "Egyptian soccer star's village has mixed feelings about native son". Al Monitor. Retrieved 20 March 2019. ^ "2018 FIFA World Cup Russia: List of players: Egypt" (PDF). FIFA. 17 June 2018. p. 9. ^ a b Abdel Fattah Faraj; Asharq Al-Awsat (4 March 2018). "The inspiring story of Egypt and Liverpool superstar Mohamed Salah". Arab News. Retrieved 29 August 2018. ^ "Man City's Kevin de Bruyne & Liverpool's Mohamed Salah show class is permanent". BBC. Retrieved April 15, 2019. ^ Egypt, Daily News (2019). "" El Mokawloon SC prepares to celebrate Salah's winning"". The Board of Directors of El Mokawloon SC, led by Mohsen Salah, contacted the Egyptian star Mohamed Salah, who used to play for El Mokawloon, to set a date for a special ceremony to celebrate his historic achievement for winning the African Player of the Year for the second time in a row. ^ a b "Toure wins his second African Player of the Year Award". Confederation of African Football online.com. 21 December 2012. Archived from the original on 29 October 2013. Retrieved 21 December 2012. ^ "Liverpool's Mohamed Salah wins African footballer of the year". The Guardian. 4 January 2018. ISSN 0261-3077. Retrieved 4 January 2018. ^ Paul Fletcher (11 December 2017). "Salah named African Footballer of the Year 2017". BBC Sport. Retrieved 4 January 2018. ^ "CAF Announces 2017 African Team of the Year". soccerladuma.co.za. Retrieved 9 September 2018. ^ "Nations Cup 2017: Team of the Tournament". Goal.com. Retrieved 9 September 2018. ^ Saketh Ayyagari (23 April 2018). "Mohamed Salah: How a boy from Egypt is now the King of Liverpool". Retrieved 9 September 2018. ^ "Al Ahly 1–1 Al Mokawloon Al Arab – Premier League 2010/2011 Live". WhoScored.com. Retrieved 9 September 2018. ^ "Egypt's Premier League cancelled". BBC Sport. 10 March 2012. Retrieved 11 March 2012. ^ Paul Rogers (6 August 2015). "11 Things You Need to Know About Mohamed Salah". A.S. Roma. Retrieved 9 September 2018. ^ Caspar Marti (16 March 2012). "Cheerful test match against Egypt's Olympics selection ends 3:4 (Translation)" (in German). FC Basel 1893. Retrieved 16 March 2012. ^ Georges Küng (10 April 2012). "FC Basel commit to young Egyptian star Mohamed Salah (Translation)". Basellandschaftliche Zeitung (in German). Retrieved 17 September 2018. ^ Ahmed Abd El Rasoul (2012). "Egypt rising star Salah officially joins FC Basel". Al-Ahram. Retrieved 10 April 2012. ^ Abdelrahman Amr (13 February 2018). "Former Basel President recalls watching Salah live for first time". KingFut. Retrieved 9 September 2018. ^ "Steaua Bucharest 4–2 Basel – result and match statistics". live-result.com. 23 June 2012. Retrieved 9 September 2018. ^ "Basel 1 – 1 Molde Team line-ups". Goal.com. 8 August 2012. Retrieved 9 September 2018. ^ KingFut Team (12 August 2012). "Mohamed Salah involved in all three Basel goals on league debut". KingFut. Retrieved 9 September 2018. ^ "Swiss Super League | Basel 2–0 Lausanne Sports". Sky Sports. 18 August 2012. Retrieved 9 September 2018. ^ "Basel break Spurs' hearts from the spot". UEFA. 11 April 2013. Retrieved 11 April 2013. ^ Trevor Haylett (3 May 2013). "Basel take heart after Chelsea defeat". UEFA. Retrieved 3 May 2013. ^ Michael Schifferle (2013). "Season review: Switzerland". UEFA. Retrieved 10 June 2013. ^ "Statistik und Resultate | Final – Schweizer Cup | 2013" (in German). Schweizerischer Fussballverband. Retrieved 20 May 2013. ^ Caspar Marti (8 July 2013). "FCB wins the 2013 Uhrencup with a victory against Red Star Belgrade (Translation)" (in German). FC Basel 1893. Retrieved 8 July 2013. ^ "Basel v Aarau Match preview". Goal.com. 13 January 2013. Retrieved 1 October 2014. ^ "Maccabi revival comes too late to halt Basel". UEFA. 6 August 2013. Retrieved 1 October 2014. ^ Sam Wallace (24 January 2014). "Mohamed Salah and the Maccabi Tel Aviv handshake furore surrounding Chelsea's latest signing". The Independent. ^ "Basel take charge against Ludogorets". UEFA. 21 August 2013. Retrieved 1 October 2014. ^ "Basel FC BS Chelsea Group stage Match Report". UEFA. 18 September 2013. Retrieved 30 August 2014. ^ "Mohamed Salah: Chelsea sign Basel midfielder for £11m". BBC Sport. 26 January 2014. Retrieved 18 September 2018. ^ "Salah Move Completed". Chelsea F.C. 18 January 2014. Retrieved 26 January 2014. ^ "Premier League | Chelsea 3–0 Newcastle". Sky Sports. 8 February 2014. Retrieved 8 February 2014. ^ Aimee Lewis (22 March 2014). "Chelsea 6–0 Arsenal". BBC Sport. Retrieved 22 March 2014. ^ "Match Report: Chelsea 3 Stoke City 0". Chelsea F.C. 6 April 2014. Retrieved 17 September 2018. ^ "Chelsea midfielder Mohamed Salah 'could be forced into military service by Egyptian government'". Metro. 19 July 2014. Retrieved 1 October 2014. ^ Jack de Menezes (21 July 2014). "Mohamed Salah: Chelsea midfielder will NOT have to serve military service after Egyptian Prime Minister steps". The Independent. Retrieved 1 October 2014. ^ "Squad Number Changes". Chelsea F.C. 15 August 2014. Retrieved 15 August 2014. ^ Andrew Murray (1 May 2018). "The making of Mohamed Salah: "At no stage did I believe I didn't belong at this level. Absolutely not"". FourFourTwo. Retrieved 3 May 2018. ^ "Jose Mourinho hits out at Schurrle and Salah after Chelsea beat Shrewsbury". ESPN. 29 October 2014. Retrieved 3 May 2018. ^ "Every Chelsea player to get a Premier League medal says Jose Mourinho". ESPN. 15 May 2015. Retrieved 24 April 2018. ^ Sam Wallace (2 February 2015). "Salah to Fiorentina on loan". The Independent. Retrieved 2 February 2015. ^ "Salah completed Fiorentina loan". Chelsea F.C. 2 February 2015. Retrieved 2 February 2015. ^ "Fiorentina, Salah chooses number 74: "For the victims of Port Said" (Translation)". la Repubblica (in Italian). 6 February 2015. Retrieved 4 August 2017. ^ "Italian Serie A | Fiorentina 3–2 Atalanta". ESPN. 8 February 2015. Retrieved 8 February 2015. ^ "Gómez and Salah scores as Fiorentina eliminate Spurs". Eurosport. Retrieved 26 February 2015. ^ "UEFA Europa League round of 16 draw". UEFA. Retrieved 27 February 2015. ^ "Juventus 1–2 Fiorentina: Salah double gives Viola vital victory". Goal.com. 5 March 2015. Retrieved 5 March 2015. ^ Gianni Verschueren (18 May 2016). "Mohamed Salah Compensation Reportedly Eyed by Fiorentina". Bleacher Report. ^ "Fiorentina 1–2 Roma". BBC Sport. 25 October 2015. ^ a b "Transfer Market | Mohamed Salah Ghaly (Translation)" (PDF) (Press release) (in Italian). A.S. Roma. 6 August 2015. Retrieved 11 June 2016. ^ "Chelsea winger Mohamed Salah joins Roma on a season-long loan". The Guardian. 6 August 2015. Retrieved 3 February 2016. ^ Gianluca Di Marzio (6 August 2015). "Roma, the official arrival of Salah from Chelsea: details of the transfer (Translation)" (in Italian). Sky Italia. Retrieved 18 November 2017. ^ Paul Rogers (6 August 2015). "Mohamed Salah to wear number 11 at Roma". A.S. Roma. Retrieved 25 August 2018. ^ "Fiorentina complain to FIFA over Salah's Roma loan from Chelsea". ESPN. 11 September 2015. ^ "Italian Serie A | Roma 2–2 Sassuolo". Sky Sports. 20 September 2015. ^ "Italian Serie A | Sampdoria 2–1 Roma". Sky Sports. Retrieved 25 August 2018. ^ "Italian Serie A | Roma 5–1 Carpi". Sky Sports. 26 September 2015. Retrieved 25 August 2018. ^ "Italian Serie A | Fiorentina 1–2 Roma". Sky Sports. 25 October 2015. ^ "Fiorentina 1–2 Roma". BBC Sport. 25 October 2015. Retrieved 25 August 2018. ^ "Roma 3–2 Leverkusen". UEFA. Retrieved 25 August 2018. ^ "Italian Serie A | Sassuolo 0–2 Roma". Sky Sports. 2 February 2016. Retrieved 25 August 2018. ^ "Italian Serie A | Carpi 1–3 Roma". Sky Sports. 12 February 2016. Retrieved 25 August 2018. ^ "Roma 5–0 Palermo". BBC Sport. 21 February 2016. Retrieved 25 August 2018. ^ "Roma 4–1 Fiorentina". BBC Sport. 4 March 2016. Retrieved 25 August 2018. ^ "Fixtures and Results | Season 2015–16 | 32^ Match Day". Lega Serie A online. Retrieved 25 August 2018. ^ "Italian Serie A | Genoa 2–3 Roma". Sky Sports. 2 May 2016. Retrieved 25 August 2018. ^ "Italian Serie A | AC Milan 1–3 Roma". Sky Sports. 14 May 2016. Retrieved 25 August 2018. ^ a b "AS Roma Awards 2015–16: Player of the Season". A.S. Roma. 28 June 2016. ^ "Salah move finalised". Chelsea F.C. 3 August 2016. ^ "Salah: Chelsea player joins Roma on permanent deal". Diario AS. Agence France-Presse. 3 August 2016. Retrieved 15 August 2018. ^ "Fixtures and Results | Season 2016–17 | 1^ Match Day". Lega Serie A online. Retrieved 25 August 2018. ^ "Fixtures and Results | Season 2016–17 | 3^ Match Day". Lega Serie A online. Retrieved 25 August 2018. ^ "Fixtures and Results | Season 2016–17 | 5^ Match Day". Lega Serie A online. Retrieved 25 August 2018. ^ "Roma 4–0 Astra Giurgiu: Match report, reaction and key statistics". A.S. Roma. 29 September 2016. Retrieved 25 August 2018. ^ "Napoli 1–3 Roma". BBC Sport. 15 October 2016. Retrieved 25 August 2018. ^ "Mohamed Salah hat-trick keeps Roma in touch with leaders Juventus". The Guardian. 6 November 2016. Retrieved 25 August 2018. ^ "Lyon 4–2 Roma". BBC Sport. 9 March 2017. Retrieved 25 August 2018. ^ "Italian Serie A | Roma 3–1 Sassuolo". Sky Sports. 19 March 2017. Retrieved 18 September 2018. ^ "Bologna 0–3 Roma". BBC Sport. 9 April 2017. Retrieved 25 August 2018. ^ "Pescara 1–4 Roma". BBC Sport. 24 April 2017. Retrieved 25 August 2018. ^ Stephen Creek (20 May 2017). "Chievo 3 Roma 5: Spalletti's men hit five to bolster grip on second". Goal.com. Retrieved 25 August 2018. ^ "Roma 3–2 Genoa". BBC Sport. 28 May 2017. Retrieved 25 August 2018. ^ "Fixtures and Results | Season 2016–17 | 38^ Match Day". Lega Serie A online. Retrieved 25 August 2018. ^ "Roma and Liverpool agree Salah transfer". A.S. Roma. 22 June 2017. Retrieved 6 September 2017. ^ Mark Dobson (22 June 2017). "Liverpool complete record £36.9m signing of Mohamed Salah from Roma". The Guardian. ^ David Lynch (22 June 2017). "Liverpool FC complete signing of Mohamed Salah". Liverpool F.C. Retrieved 22 June 2017. ^ Neil Johnston (12 August 2017). "Watford 3–3 Liverpool". BBC Sport. Retrieved 15 August 2017. ^ "Liverpool 4–2 Hoffenheim". The Guardian. 31 March 2018. ^ Phil McNulty (27 August 2017). "Liverpool 4–0 Arsenal". BBC Sport. Retrieved 31 August 2017. ^ "Mohamed Salah claims Player of the Month award for August". Liverpool F.C. 5 September 2017. ^ Chris Burton (17 October 2017). "Liverpool record Champions League firsts with seven goal Mauling". Goal.com. Retrieved 18 October 2017. ^ "Why didn't he celebrate?! Fans can't believe Mo Salah's reaction to scoring against former club Chelsea". Daily Mirror. 25 November 2017. Retrieved 26 November 2017. ^ Mike Henson (29 November 2017). "Stoke City 0 Liverpool 3". BBC Sport. Retrieved 30 November 2017. ^ Stephen Crawford (17 December 2017). "Liverpool Make History with Record Away Goal Tally". Goal.com. Retrieved 18 December 2017. ^ Ben Fisher (17 December 2017). "Mohamed Salah shreds Bournemouth to leave Suárez and Rush in his wake". The Guardian. Retrieved 18 December 2017. ^ "Mohamed Salah 'on his way' to Lionel Messi comparisons – Liverpool boss Klopp". BBC Sport. 17 March 2018. ^ a b "Mohamed Salah: Liverpool forward voted PFA Player of the Year 2017–18". BBC Sport. 23 April 2018. Retrieved 5 May 2018. ^ a b "Manchester City players dominate PFA team of the year". BBC Sport. 18 April 2018. Retrieved 5 May 2018. ^ "Mohamed Salah: The night the 'phenomenal' Liverpool man downed Roma". BBC Sport. 24 April 2018. Retrieved 25 April 2018. ^ a b c Nick Wright (31 March 2018). "Mohamed Salah breaking records with Liverpool scoring exploits". Sky Sports. Retrieved 5 April 2018. ^ Jacob Steinberg (2 May 2018). "Roma 4–2 Liverpool (agg: 6–7): Champions League semi-final – as it happened". The Guardian. Retrieved 6 May 2018. ^ Shina Oludare (13 May 2018). "Mohamed Salah wins Premier League Golden Boot". Goal.com. Retrieved 13 May 2018. ^ James Goldman (26 May 2018). "Liverpool star Mohamed Salah in tears after suffering injury in Champions League final". Metro. Retrieved 29 May 2018. ^ "Mohamed Salah in tears as Champions League final ends in early injury heartbreak after Sergio Ramos challenge". The Daily Telegraph. Retrieved 27 May 2018. ^ Glenn Price (26 May 2018). "Egypt 'optimistic' Mohamed Salah can play in World Cup after shoulder injury". ESPN. ^ Callum Davis (27 May 2018). "Sergio Ramos sends good well wishes to Mohamed Salah after injured Liverpool forward's Champions League final ends in tears". The Daily Telegraph. Retrieved 30 May 2018. ^ James Carroll (2 July 2018). "Mohamed Salah signs new long-term Liverpool deal". Liverpool F.C. Retrieved 2 July 2018. ^ James Carroll (2 July 2018). "Jürgen Klopp: Salah's commitment is a sign for Liverpool". Liverpool F.C. Retrieved 2 July 2018. ^ Steve Sutcliffe (12 August 2018). "Liverpool 4–0 West Ham". BBC Sport. Retrieved 13 August 2018. ^ Simon Burnton (12 August 2018). "Liverpool 4–0 West Ham United: Premier League – as it happened". The Guardian. ISSN 0261-3077. Retrieved 13 August 2018. ^ Emlyn Begley (20 August 2018). "Crystal Palace 0–2 Liverpool". BBC Sport. Retrieved 25 August 2018. ^ "Did Mohamed Salah dive to win penalty against Palace?". London Evening Standard. Retrieved 25 August 2018. ^ Andy Kelly (25 August 2018). "Mohamed Salah downs Brighton as Liverpool capitalise on Manchester City hiccup to move top". The Independent. Retrieved 25 August 2018. ^ a b "Luka Modrić wins UEFA Men's Player of the Year award". UEFA. Retrieved 31 August 2018. ^ "Modrić, Ronaldo and Salah up for Player of the Year". UEFA. Retrieved 25 August 2018. ^ "Champions League positional awards: nominees announced". UEFA. Retrieved 25 August 2018. ^ "Cristiano Ronaldo: Champions League Forward of the Season". UEFA. Retrieved 31 August 2018. ^ Liam Grace (3 September 2018). "Mohamed Salah, Cristiano Ronaldo and Luka Modric nominated for Best FIFA Men's Player". Sky Sports. Retrieved 3 September 2018. ^ a b "The Best FIFA Men's Player". FIFA. 24 September 2018. ^ Dov Rawson (25 September 2018). "James Milner reacts brilliantly on Twitter to Mo Salah's controversial Puskas Award". GiveMeSport.com. Retrieved 29 September 2018. ^ "Mohamed Salah trolled by Liverpool team-mate over Puskas Award". Metro. 25 September 2018. Retrieved 29 September 2018. Mohamed Salah controversially won the Puskas award at the Best FIFA Football Awards 2018 on Monday night ... [he] was delighted to pick up the award, despite the controversy. ^ a b "Mohamed Salah scores 50th Liverpool goal – and SMASHES long-standing record". Liverpool Echo. Retrieved 25 October 2018. ^ "Bournemouth 0–4 Liverpool". BBC Sport. 8 December 2018. Retrieved 14 December 2018. ^ "Liverpool 1–0 Napoli: Salah scores as Reds reach Champions League knockout stage". BBC Sport. 11 December 2018. Retrieved 14 December 2018. ^ "The stats behind Mohamed Salah's 50 Premier League goals". Sky Sports. 20 January 2019. Retrieved 21 January 2019. ^ "Mohamed Salah: West Ham investigate racist abuse of Liverpool striker". 6 February 2019 – via www.bbc.co.uk. ^ Sanders, Emma (5 April 2019). "Mohamed Salah: Forward enters Liverpool record books with fastest 50 goals". BBC Sport. Retrieved 6 April 2019. ^ Barnish, Adam (5 April 2019). "Mohamed Salah Breaks Liverpool Record With 50th Premier League Goal in Friday Night Win". 90Min. Retrieved 9 April 2019. ^ Magowan, Alistair (14 April 2019). "Mohamed Salah scores stunning goal as Reds reclaim lead". BBC Sport. Retrieved 16 April 2019. ^ "Men's Olympic Football Tournament – Previous Tournaments". FIFA. Retrieved 25 August 2018. ^ "FIFA U-20 World Cup Colombia 2011 – Matches – Argentina-Egypt". FIFA. Retrieved 8 September 2018. ^ "Olympic Football Tournament London 2012 – Men | Egypt". FIFA. Retrieved 8 September 2018. ^ Daniel Taylor (26 July 2012). "Olympics 2012: football | Brazil hang on to the three points in the face of Egypt's brave comeback | Brazil 3–2 Egypt". The Guardian. Retrieved 8 September 2018. ^ "Relive Egypt's 1–1 draw with New Zealand (London 2012)". Al-Ahram. 29 July 2012. Retrieved 8 September 2018. ^ "Olympic Games – Group C | Egypt 3–1 Belarus". Sky Sports. 1 August 2012. Retrieved 8 September 2018. ^ Barney Corkhill (4 August 2012). "London 2012 Olympics | Result: Japan 3–0 Egypt". Sports Mole.co.uk. Retrieved 8 September 2018. ^ "Sierra Leone 2–1 Egypt: Pharaohs eliminated from Afcon qualification". Goal.com. Retrieved 25 August 2018. ^ "Egypt 3–0 Niger: The Pharaohs thrash the Mena, who qualify nonetheless". Goal.com. Retrieved 25 August 2018. ^ "WC Africa – Group 7 | Guinea 2–3 Egypt". Sky Sports. 10 June 2012. Retrieved 28 June 2018. 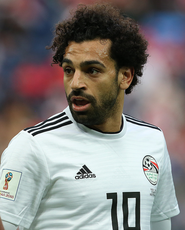 ^ "Salah stars as Egypt stay on course for World Cup Finals". CNN. 9 June 2013. Retrieved 6 August 2015. ^ "Egypt through to final round of World Cup qualifying". BBC Sport. 16 June 2013. Retrieved 6 August 2015. ^ Hatem Maher (10 September 2013). "Egypt maintain perfect World Cup qualifying run with 4–2 win". Al-Ahram. Retrieved 8 September 2018. ^ "Botswana vs Egypt 0 – 2 | AFCON Qualification | 2015 Morocco | Group Stage | World Football". www.worldfootball.com. Retrieved 8 September 2018. ^ Hatem Maher (15 October 2014). "Egypt complete double over Botswana with another 2–0 win". Al-Ahram. Retrieved 8 September 2018. ^ Omar Ahmed Morsy (19 November 2014). "AFCON 2015 – Tunisia vs Egypt Live Commentary". KingFut. Retrieved 8 September 2018. ^ "RELIVE: Tunisia v Egypt (2015 AFCON qualifiers)". Al-Ahram. Retrieved 8 September 2018. ^ "Official Declaration of the preliminary list of the Egyptian team for the Nations of Africa (Translation)" (in Arabic). masralarabia.com. 29 December 2016. Retrieved 25 August 2018. ^ "Afcon 2017: Egypt's El Hadary could make Nations Cup history". BBC Sport. 4 January 2017. Retrieved 25 August 2018. ^ "Mohamed Salah's stunning free-kick for Egypt snatches win and top spot from Ghana". Eurosport. 25 January 2017. ^ a b "AFCON 2017: CAF names team of the tournament". soccer24.co.zw. 6 February 2017. Retrieved 19 July 2017. ^ "Mo Salah's late penalty gives Egypt first World Cup qualification since 1990". The Guardian. 8 October 2017. ^ "Salah confirmed in provisional Egypt World Cup squad". Liverpool F.C. Retrieved 19 June 2018. ^ Seif Soliman (4 June 2018). "Egypt announce final 23-man squad for 2018 World Cup". KingFut. Retrieved 19 June 2018. ^ "2018 FIFA World Cup Russia™ | Egypt 0–1 Uruguay". FIFA. 15 June 2018. Retrieved 19 June 2018. ^ "2018 FIFA World Cup Russia™ | Russia 3–1 Egypt". FIFA. Retrieved 19 June 2018. ^ Saj Chowdhury (25 June 2018). "Saudis beat Egypt despite Salah strike". BBC Sport. Retrieved 25 June 2018. ^ "Salem al-Dawsari snatches win for Saudi Arabia against Egypt". The Guardian. 25 June 2018. Retrieved 25 June 2018. ^ "Mo Salah: Liverpool forward scores twice as Egypt beat Niger". BBC Sport. 8 September 2018. Retrieved 9 September 2018. ^ a b Ken Early (27 November 2017). "Ken Early: Mohamed Salah is not a truly great winger". The Irish Times. Retrieved 3 September 2018. ^ a b Mark Critchley (24 April 2018). "Mohamed Salah's two different but equally brilliant Liverpool goals assert his place as world's third-best player". The Independent. Retrieved 3 September 2018. ^ "Xavi: Salah's speed is unbelievable". A.S. Roma. 29 March 2016. Retrieved 10 January 2017. ^ "AS Roma Awards 2015–16: The Complete List of Winners". A.S. Roma. 30 June 2016. Retrieved 10 January 2017. ^ Timothy Abraham (30 December 2017). "Mohamed Salah double fires Liverpool to victory against Leicester but win soured by late injury". The Independent. Retrieved 1 October 2018. ^ "Salah Ghaly, Mohamed" (in Italian). Treccani: Enciclopedie Online. Retrieved 10 January 2017. ^ Glenn Price (28 June 2018). "Liverpool's Mohamed Salah: Premier League is perfect for me". ESPN. ^ Paul Gorst (15 December 2017). "How Mo Salah went from teary left-back to goalscoring wing wizard". Liverpool Echo. Reach. Retrieved 9 September 2018. ^ Dean Jones (13 December 2017). "The Making of Liverpool's Egyptian Superstar Mo Salah". Bleacher Report. Retrieved 9 September 2018. ^ a b c Yasmine Al-Sayyad (25 May 2018). "Liverpool F.C. 's Mohamed Salah, an Arab Muslim Sports Star Subtly Confronting Racism and Islamophobia". The New Yorker. Retrieved 25 May 2018. Being religious yet apolitical is partly what has made Salah appealing to the predominantly white fan base of England's Premier League. "I think part of Salah's charm is that he's not an outwardly political figure addressing Islamophobia in England," Khaled Beydoun, a law scholar and the author of "American Islamophobia," told me. "He is able to effectively erode negative views of Muslims and challenge Islamophobia" just by being himself. ^ "Salah deal 'influenced by Mata move'". ESPN. Retrieved 24 January 2014. ^ Henry Winter (24 January 2014). "Jose Mourinho confirms Chelsea are closing in on £12m deal for Basle attacker Mohamed Salah". The Daily Telegraph. Retrieved 24 January 2014. ^ Giulia Zonca (6 March 2015). "Salah, beyond goals. The 10 things to know about the prodigy of the moment (Translation)". La Stampa (in Italian). Retrieved 10 January 2017. ^ Matteo Politanò (5 March 2015). "All crazy about Salah, the Messi of Egypt (Translation)" (in Italian). Panorama.it. Retrieved 10 January 2017. ^ "Ronaldo loves Liverpool's Mohamed Salah and his 'Lionel Messi style'". Liverpool Echo. Reach. Retrieved 28 June 2018. ^ "Mohamed Salah reveals his two football idols as the Liverpool star dismisses Messi and Ronaldo comparisons". Liverpool Echo. Reach. Retrieved 6 September 2018. ^ "A touch of class: Liverpool star Mohamed Salah refuses to celebrate two stunning goals vs his former club AS Roma". London Evening Standard. Retrieved 8 October 2018. ^ "Mohamed Salah is married to Maggi Salah and the couple have a little daughter named Makka". Tribuna.com. 10 July 2017. Retrieved 4 November 2017. ^ Mehedi Islam. "Chelsea's New Muslim Player Mohamed Salah Celebrates By Prostrating". Retrieved 4 November 2017. ^ "Will Mo Salah be on the FIFA 19 cover?". Egypt Independent. 25 June 2018. ^ "Here's where to get the Adidas X18 boots Mohamed Salah will wear for Egypt at the World Cup". Liverpool Echo. Reach. 25 June 2018. ^ "Adidas release star-studded World Cup advert featuring Messi, Beckham, Mourinho, Pharrell and more". FourFourTwo. Future Publishing. 25 June 2018. ^ Emilia Bona (15 March 2018). "Mo Salah Egyptian Vodafone advert is out – see the Liverpool star visiting Merseyside landmarks". Liverpool Echo. Reach. Retrieved 8 September 2018. ^ Osha Mahmoud (26 April 2018). "'Our son': Mohamed Salah splashes cash to give home village a cleaner future". Middle East Eye. Retrieved 8 September 2018. ^ Hossam Rabie (6 June 2018). "Egyptian soccer star's village has mixed feelings about native son". Al-Monitor. Retrieved 24 June 2018. ^ "Salah's hometown charity project almost finalized: father". Egypt Independent. 2018-10-10. Retrieved 2019-04-16. ^ "A Story About Mohamed Salah And A Thief Who Stole From His Family Goes Viral". 22 December 2017. Retrieved 8 September 2018. ^ Kristian Walsh (1 February 2018). "Salah's stunning gesture to supporter is reminiscent of Messi". Liverpool Echo. Reach. Retrieved 8 September 2018. ^ Marwan, Ahmed (30 November 2018). "Mohamed Salah, the Liverpool superstar giving away thousands to help Egyptians". ^ Alec Luhn (23 June 2018). "Mohamed Salah given honorary citizenship of Chechnya by strongman ruler accused of human rights abuses". The Daily Telegraph. ISSN 0307-1235. Retrieved 9 September 2018. ^ "Mohamed Salah used for 'political propaganda' by Ramzan Kadyrov, say gay rights and equality campaigners". Sky Sports. 13 June 2018. Retrieved 24 June 2018. ^ "Mohamed Salah honoured by Chechnya leader Ramzan Kadyrov". Sky Sports. 24 June 2018. Retrieved 24 June 2018. ^ "Video apparently shows Mo Salah using a phone while driving". BBC News. 13 August 2018. Retrieved 13 August 2018. ^ "Liverpool refer Mohamed Salah to police after allegedly using phone while driving". Sky Sports. 14 August 2018. Retrieved 13 August 2018. ^ Sean Morrison (13 August 2018). "Police probe as Mo Salah 'is filmed using mobile phone while driving'". London Evening Standard. Retrieved 13 August 2018. ^ Jonathan Humphries (14 August 2018). "Mo Salah mobile phone autograph hunter speaks out after online accusations". Liverpool Echo. Reach. Retrieved 27 August 2018. ^ Ashfak Mohamed (14 August 2018). "Man who took Mohamed Salah 'phone video' denies sending it to police". Independent Online. Retrieved 27 August 2018. ^ Tarek Talaat (27 August 2018). "Mohamed Salah accuses Egyptian FA of ignoring complaints over image rights". BBC Sport. Retrieved 27 August 2018. ^ Ian Doyle (27 August 2018). "Liverpool forward Mohamed Salah embroiled in fresh row with Egyptian FA over image rights". Liverpool Echo. Reach. Retrieved 27 August 2018. ^ "The Rise of the New Egyptian King, Mohamed Salah". OkayAfrica. 2018-06-18. Retrieved 2019-04-16. ^ Hytner, David (2016-01-14). "Arsenal's Mohamed Elneny: the tireless street footballer who slept with a ball". The Guardian. ISSN 0261-3077. Retrieved 2019-04-16. ^ "Mohamed Salah inspires "I'll be Muslim too" chant". BBC News. 16 February 2018. ^ Din, Tusdiq (1 March 2018). "Mohamed Salah: Is Liverpool striker's success improving engagement with Muslim fans?". BBC Sport. Retrieved 14 March 2018. ^ Jalal Baig (26 May 2018). "Champions League final: Liverpool star Mohamed Salah's unapologetic Muslim faith sends extraordinary message". NBC News. Retrieved 9 October 2018. ^ "UPDATED FIFA 19 new celebrations and tutorial, ft Cristiano Ronaldo, Paul Pogba and Neymar". talkSPORT. Retrieved 11 October 2018. ^ "Pharaoh Salah aims to fire up Reds too". The Straits Times. Singapore Press Holdings. 17 October 2017. ^ Amr Mamdouh (23 June 2017). "Mohamed Salah, the pharaoh who conquered Europe". el-balad.com. Sada El Balad. ^ Omar Niyazi (26 January 2014). "In Pictures: The Rise of Chelsea's Pharaoh – Mohamed Salah". KingFut. ^ Melissa Reddy (4 February 2018). "Egyptian King Salah robbed by controversial penalties in Liverpool-Spurs thriller". Goal.com. ^ James Pearce (6 February 2018). "Liverpool must do everything to keep 'Egyptian King' Mohamed Salah on his throne". Liverpool Echo. ^ Kristian Walsh (6 February 2018). "Liverpool fans have brilliant new Mohamed Salah song". Liverpool Echo. ^ Eshlin Vedan (29 June 2018). "Egyptian school named after Liverpool star Salah following World Cup heroics". Tribal Football.com. ^ "Mohamed Salah news: Liverpool star comes out to meet Egypt fans after huge crowd appears outside of home". Goal.com. 29 June 2018. Retrieved 29 June 2018. ^ "NY Times Square displays Mohamed Salah's huge mural". Egypt Independent. 10 June 2018. Retrieved 8 September 2018. ^ "Mohamed Salah on Twitter". Twitter. Retrieved 8 September 2018. ^ Magdy Samaan; Chris Bascombe (23 April 2018). "How Salah became the main symbol of hope for Egypt's rising generation". The Sydney Morning Herald. Retrieved 9 September 2018. ^ Mohamed Mahmoud (10 January 2018). "Egypt's 'fourth pyramid' Mohamed Salah: 'He is one of us'". Middle East Eye. Retrieved 9 September 2018. ^ a b "Mohamed Salah: Summary". Soccerway. Perform Group. Retrieved 11 March 2019. ^ a b "Salah, Mohamed". National Football Teams. Benjamin Strack-Zimmerman. Retrieved 26 December 2018. ^ Kingsley Kobo (8 October 2011). "Egypt 3–0 Niger: The Pharaohs thrash the Mena, who qualify nonetheless". Goal.com. Retrieved 27 July 2016. ^ Ahmed Abd El Rasoul (27 February 2012). "'Mourning' Pharaohs hammer Kenya in Doha friendly". Al-Ahram. Retrieved 27 July 2016. ^ "Egypt/Uganda: Nation beats Uganda 2–1 in friendly in Sudan". AllAfrica.com. 30 March 2012. Retrieved 27 July 2016. ^ Mahmoud Elassal (1 April 2012). "Egypt crush Chad 4–0 in friendly game". Al-Ahram. Retrieved 27 July 2016. ^ "Egypt 3–0 Togo: Mohamed Salah nets brace in Pharaohs win". Goal.com. 23 May 2012. Retrieved 27 July 2016. ^ "Guinea 2–3 Egypt: Aboutrika brace and Salah's last-gasp winner power Pharaohs in Conakry". Goal.com. 10 June 2012. Retrieved 27 July 2016. ^ "Egypt 2–3 Central African Republic: Momi double stuns Pharaohs in Alexandria". Goal.com. 15 June 2012. Retrieved 27 July 2016. ^ Habib El Magrissy (6 February 2013). "Egypt fall to Chile in Madrid". KingFut. Retrieved 27 July 2016. ^ "Egypt thrash Zimbabwe 4–2 to secure 12-point lead". starafrica.com. 9 June 2013. Retrieved 27 July 2016. ^ "Egypt qualify for the final World Cup qualifying play-offs after beating Mozambique 1–0". EPFA Egypt.com. 16 June 2013. Retrieved 27 July 2016. ^ "Egypt beat Uganda 3–0 as friendly goes ahead despite political upheaval". Al-Ahram. 14 August 2013. Retrieved 27 July 2016. ^ Hatem Maher (10 September 2013). "Egypt maintain perfect World Cup qualifying run with 4–2 win". Al-Ahram. Retrieved 27 July 2016. ^ Hatem Maher (5 March 2014). "Egypt give Gharib winning start with 2–0 victory over Bosnia". Al-Ahram. Retrieved 27 July 2016. ^ "Egypt fall 3-2 in Santiago to World Cup-bound Chile". KingFut. 31 May 2014. Retrieved 18 February 2019. ^ Hatem Maher (10 October 2014). "Egypt revive Nations Cup hopes with 2–0 win in Botswana". Al-Ahram. Retrieved 27 July 2016. ^ "Egypt seal double over Botswana in 2015 AFCON qualifying". KingFut. 15 October 2014. Retrieved 27 July 2016. ^ "RELIVE: Tunisia v Egypt (2015 AFCON qualifiers)". Al-Ahram. 19 November 2014. Retrieved 27 July 2016. ^ "Salah leads Egypt to 3–0 thrashing of Tanzania". africanfootball.com. 14 June 2015. Retrieved 27 July 2016. ^ Omar Zaazou (6 September 2015). "Morsi hat-trick helps Egypt thump Chad 5–1 away from home". Al-Ahram. Retrieved 27 July 2016. ^ "Afcon 2017: Salah scores late leveller for Egypt against Nigeria". BBC Sport. 25 March 2016. Retrieved 27 July 2016. ^ Khaled Ali (4 June 2016). "Salah brace against Tanzania seals AFCON comeback". KingFut. Retrieved 27 July 2016. ^ "Egypt earn comeback win at Congo to lead World Cup qualifying group". Al-Ahram. 9 October 2016. Retrieved 9 October 2016. ^ "Egypt 2 Ghana 0: Salah, Said put Black Stars in trouble". Yahoo Sports. 13 November 2016. Retrieved 13 November 2016. ^ "Egypt v Ghana: AFCON 2017 – as it happened". The Guardian. 25 January 2017. Retrieved 25 January 2017. ^ "Burkina Faso 1–1 Egypt (3–4 pens): AFCON 2017 semi-final – as it happened". The Guardian. 1 February 2017. Retrieved 1 February 2017. ^ "2018 World Cup: Egypt leapfrog Uganda at top of Group E". BBC Sport. 5 September 2017. Retrieved 5 September 2017. ^ "Liverpool star Mo Salah sends Egypt to Russia 2018 with winner in fifth minute of added time against Congo". Daily Mirror. 8 October 2017. Retrieved 8 October 2017. ^ "Salah goal spoiled by Ronaldo double as Portugal earn 2–1 win over brave Egypt". Al-Ahram. 5 September 2017. Retrieved 23 March 2018. ^ Amy Lawrence (19 June 2018). "Russia all but qualify for knockout stage with win over Mo Salah's Egypt". The Guardian. Retrieved 18 February 2019. ^ Mahmoud Khaled (25 June 2018). "Egypt finish bottom of World Cup group after last-gasp defeat to Saudi Arabia". KingFut. Retrieved 18 February 2019. ^ Luke McBride (8 September 2018). "Aguirre's first game ends in Egypt beating Niger 6-0 in AFCON qualifier". KingFut. Retrieved 18 February 2019. ^ Mahmoud Khaled (12 October 2018). "Handy victory for Egypt against Eswatini in AFCON qualifiers". KingFut. Retrieved 18 February 2019. ^ Ali Ismail (16 November 2018). "Egypt beat Tunisia in thrilling form in AFCON qualifiers". KingFut. Retrieved 18 February 2019. ^ Phil McNulty (26 May 2018). "Real Madrid 3–1 Liverpool". BBC Sport. Retrieved 27 May 2018. ^ "Egypt picks Orange CAN U-20 bronze medal". Confederation of African Football online.com. 1 May 2011. Archived from the original on 3 May 2011. Retrieved 4 August 2017. ^ "Team Sheets for 3rd place match" (PDF). Confederation of African Football online.com. 1 May 2011. Archived from the original (PDF) on 12 August 2011. Retrieved 4 August 2017. ^ Amy Lofthouse (5 February 2017). "Africa Cup of Nations – Final | Egypt 1 – 2 Cameroon". BBC Sport. Retrieved 9 February 2017. ^ "Mohamed Salah Takes Three". Tages-Anzeiger. 27 January 2014. Retrieved 17 September 2018. ^ "Globe Soccer Awards Best Arab Player of the Year 2016". Globe Soccer. 27 December 2016. Archived from the original on 29 December 2016. ^ "CAF News | Awards Winners | Previous Editions | 2016". Confederation of African Football online.com. 5 January 2017. Retrieved 7 January 2017. ^ "SALAH AND MANE PICKED IN FIRST AFRICA BEST 11". FIFPro. 8 January 2019. Retrieved 8 January 2019. ^ a b c "Mohamed Salah: Overview". Premier League. Retrieved 29 September 2018. ^ "Mo Salah wins November's PFA Bristol Street Motors Fans' Player of the Month". The PFA. Archived from the original on 12 January 2018. Retrieved 12 January 2018. ^ "Salah wins PFA Player of the Month". Liverpool F.C. ^ "Salah named PFA Player of the Month". Liverpool F.C. ^ "Mohamed Salah named PFA Player of the Month for March". Liverpool F.C. ^ "Mohamed Salah named PFA Player of the Month". Liverpool F.C. ^ "Mohamed Salah wins PFA Player of the Month award". Liverpool F.C. ^ Piers Edwards (11 December 2017). "Mohamed Salah named BBC African Footballer of the Year". BBC Sport. Retrieved 16 March 2017. ^ "Mohamed Salah named BBC African Footballer of the Year 2018". BBC Sport. 14 December 2018. Retrieved 14 December 2018. ^ "Mohamed Salah: Liverpool and Egypt forward named African Player of the Year". BBC Sport. 5 January 2018. Retrieved 5 January 2018. ^ "Mohamed Salah: Liverpool and Egypt forward named Caf African Player of the Year". BBC Sport. 8 January 2019. Retrieved 8 January 2019. ^ "Salah named as Goal's Arab Player of the Year". Goal.com. 2 February 2018. Retrieved 2 February 2018. ^ David Lynch (1 May 2018). "Salah named FWA Footballer of the Year". Liverpool F.C. Retrieved 1 May 2018. ^ a b Chris Shaw (10 May 2018). "Mohamed Salah takes top prizes at LFC Players' Awards". Liverpool F.C. Retrieved 10 May 2018. ^ "Mohamed Salah named PFA Fans' Player of the Year". Liverpool F.C. 21 May 2018. Retrieved 21 May 2018. ^ "Squad of the Season". UEFA. 27 May 2018. ^ "Ramzan Kadyrov awarded the Egyptian football player Mohammad Salah with the title 'Honorary Citizen of the Chechen Republic' (Translation)" (in Russian). The Chechen Republic. 23 June 2018. Retrieved 23 June 2018. ^ "Mohammed Salah became an honorary citizen of the Chechen Republic (Translation)" (in Russian). ChGTRK "Grozny". 22 June 2018. Retrieved 22 June 2018. ^ "Forward of the Season". UEFA. 30 August 2018. Retrieved 30 August 2018. ^ "Salah's Merseyside derby goal wins Puskas Award". Liverpool F.C. 24 September 2018. ^ "World 11: The Reserve Teams for 2017–18". FIFPro. 24 September 2018. ^ "Modric beats Ronaldo & Salah to win Goal 50". Goal.com. 13 November 2018. Retrieved 13 November 2018. ^ "Mohamed Salah wins FSF Men's Player of the Year award". Liverpool F.C. 3 December 2018. Retrieved 3 December 2018. ^ "Mohamed Salah takes the 6th place of the Ballon d'Or France Football 2018". France Football. 3 December 2018. Retrieved 3 December 2018. ^ "Mohamed Salah Is on the 2019 TIME 100 List". Time. 17 April 2019. Retrieved 17 April 2019. ^ Chris Shaw (13 May 2018). "Mohamed Salah wins Golden Boot with new PL record". Liverpool F.C. Retrieved 13 May 2018. ^ Ian Doyle (21 April 2018). "Liverpool analysis – No worries for Jurgen Klopp as Mohamed Salah rewrites record books". Liverpool Echo. Reach. Retrieved 21 April 2018. ^ Vanguard (16 April 2018). "Africa: Liverpool's Salah First African to Score 30 Goals in EPL Season". Allafrica.com. Retrieved 16 April 2018. ^ Zinny Boswell (15 December 2017). "Liverpool's Mohamed Salah wins November Premier League Player of the Month award". Sky Sports. Retrieved 15 December 2017. ^ "Salah named EA SPORTS Player of the Month for February". Premier League. ^ "Salah 'proud' to set new Premier League mark". Premier League. 13 May 2018. Retrieved 13 May 2018. ^ a b c d e f Dominic Raynor. "When, where and how Salah broke record after record". Liverpool F.C. Retrieved 16 May 2018. ^ "Mohamed Salah Profile, News & Stats". Premier League. Retrieved 3 January 2019. ^ "Salah matches Torres record as he hits Premier League half-century". Goal. Retrieved 19 January 2019. ^ "L'Pool 5–2 Roma: Salah breaks Eto'o's UCL record with brace". fc Naija.com. Retrieved 24 April 2018. ^ a b "Most goals in a debut season". LFC History.net. Retrieved 23 April 2018. ^ Glenn Price (11 April 2018). "Mohamed Salah, Roberto Firmino make Liverpool history by scoring at Man City". ESPN. Retrieved 11 April 2018. ^ "Salah breaks Liverpool record with 50th Reds goal". Goal.com. 24 October 2018. Retrieved 24 October 2018. ^ "Mohamed Salah becomes fastest Liverpool player to reach 40 Premier League goals". Sky Sports. 8 December 2018. Retrieved 8 December 2018. ^ "Mohamed Salah: Forward enters Liverpool record books with fastest 50 goals". BBC. 5 April 2019. Retrieved 5 April 2019. ^ "Liverpool left sweating as Salah limps out of Egypt clash". Goal.com. 12 October 2019. ^ "Salah's composed finish gives Egypt exciting 3–2 win over Tunisia". Ahram Online. 16 November 2019. ^ "Mohamed Salah Overview". Serie A. Retrieved 21 November 2018. ^ "Top 10: AS Roma players with the most assists 2016–17". A.S. Roma. 8 June 2017. Retrieved 8 June 2017. ^ "Liverpool Top Scorers". BBC Sport. 26 May 2018. Archived from the original on 10 July 2018. 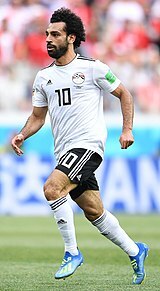 Wikimedia Commons has media related to Mohamed Salah.